I found this adorable painting online. It perfectly expresses how much I miss my Beloved. His birthday is today. He would have been 75 years old. How I miss him. Life has gone on..and I have made steps toward healing, but I will always miss him. He made a tremendous impact in my life. There are so many things I never would have done, but for him. Life with him was a great adventure. It is hard to be alone now... But God walks, talks, weeps and laughs with me. He is my good friend and He knows exactly how I feel today. 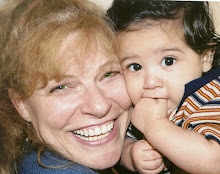 Please hug your own beloved today--never take one another for granted. One never knows how much time you'll have together. Blessing, joy and peace be to you, dear ones. I love Easter. The artists of old created such beautiful art pieces celebrating Easter. This one is a favorite of mine. As you can see, Easter is one of my favorite times of the year--so filled with hope and joy. The Lily of the Valley flowers are beginning to bloom in my garden, though it has been quite cold and damp since our warm spell back in early March. This is a fanciful picture I took of a filbert orchard during the 2012 flood. I haven't been able to get out to take pictures this time. There has been extensive flooding in our area over the weekend with roads closed and lots of damage to homes, especially in Corvalls. Friday, there was a water rescue on the Willamette River, which is just a few blocks from where I live. Why someone would go kayaking on a raging, flooding river is anyone's guess. That fellow is lucky to be alive! Hello sweet Friends. 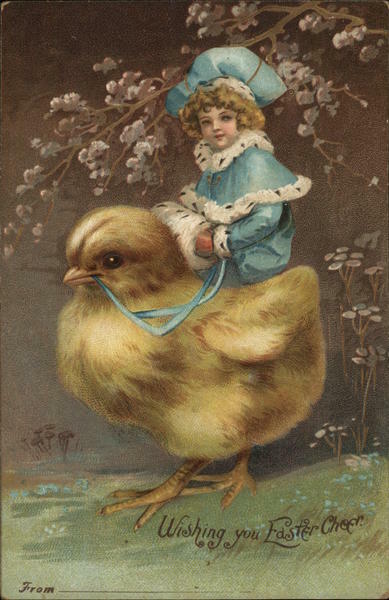 I love the old time Easter postcards where beautifully dressed children take a ride on a little chick. This one is especially sweet. And as it says, I am wishing you Easter cheer! 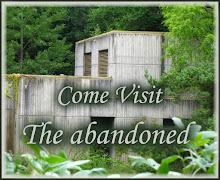 Happy Postcard Friendship Friday! * LINKING UP: You can put your link in any time between now and next Thursday. Postcard Friendship Friday is open for the entire week! * BADGE: When you submit a postcard, be sure to put a link back to this page. You can copy and paste the PFF badge, which has the link embedded. Thank you! * THEMES: You don't have to stick to the theme I choose each Friday. Just put up the postcards you love and tell us why you like them. 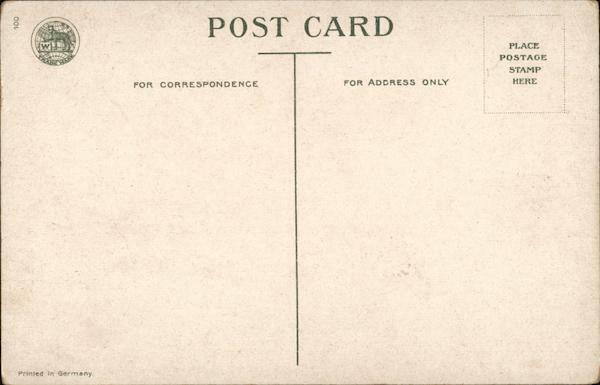 * REMINDER: If you post anything other than a postcard to share, your link will be removed. Postcard Friendship Friday is specifically dedicated to postcards, both modern and vintage. Isn't this a beautiful postcard? I surely do wish these were available in these more modern times. I am a big fan of Ellen Clapsaddle. What a wonderful artist she was! She's an inspiration to me. 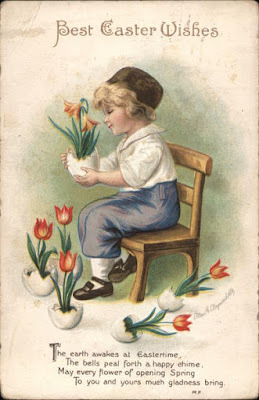 Happy Easter, dear Friends--Spring surely can't be much further away! My sweet Grandpa Lester would be 122 years old today! He was my best friend when I was a child. I told him my little girl secrets, he taught me how to garden and the trick of seeing shapes in the trees and clouds. I still miss him--even all these years later. Oddly enough, my garbage can began to sing "Happy Birthday" Saturday night. LOL Yes, and this morning--it was transported to the dump and I have a feeling it is STILL singing! 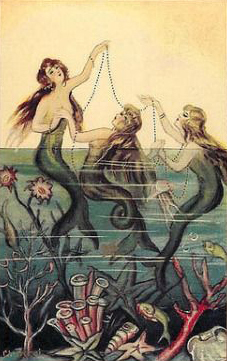 International Mermaid Day is a newer holiday--I believe this is the fourth year it has been formally celebrated. Though there are several dates listed as International Mermaid Day, our local news reporters were talking about this unusual holiday this morning! I have tried to discover how this day was established and so far--I have come up empty handed. I love mermaids. I've collected books, cards, postcards and fairy tales about them for years. In older lore, they aren't the beautiful, kind beings of today. In fact, they were a little scary! 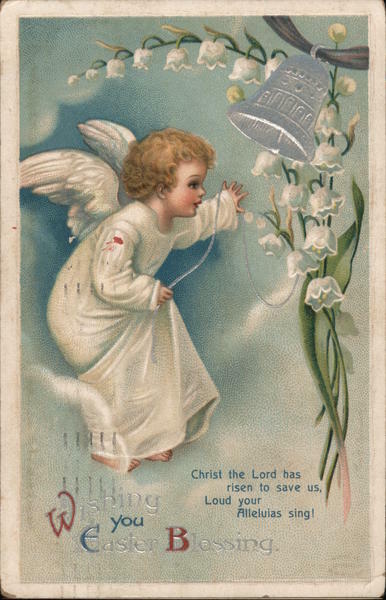 This beautiful vintage postcard is a part of my cyber collection. I couldn't find a back for it--however, even so--I wanted to share it because its whimsical qualities. Happy Postcard Friendship Friday. I hope you find some fun ways to celebrate International Mermaid Day! Have a wonderful weekend, dear Friends. I love the way the young man is looking at this gentle maiden. However her companion the Dog seems a bit suspicious. What a beautiful postcard. 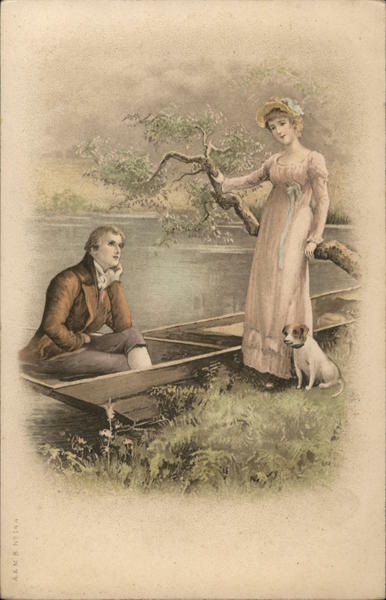 I wonder if she WILL go for ride in that boat upon the lake. I finally went to the doctor--looks like I have pneumonia. Thankfully I may be over the worst of this soon. Happy Postcard Friendship Friday and have a lovely weekend all you wonderful people out there! 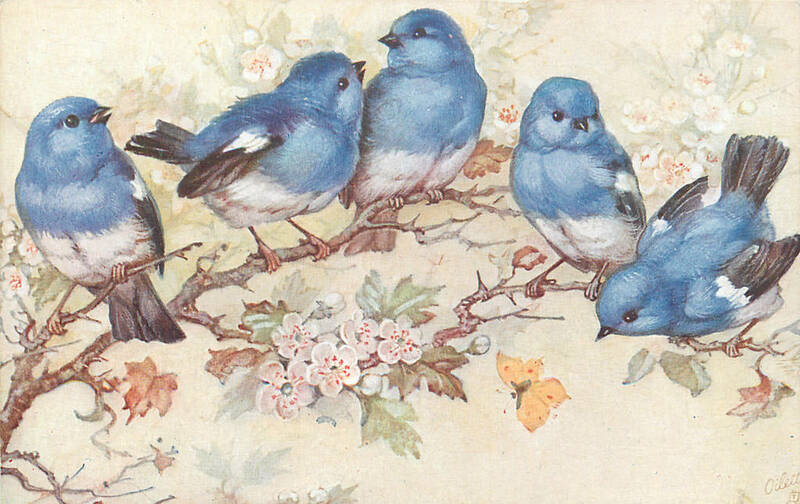 I love this postcard--bluebirds are my favorite bird. I took this from my "cyber" collection, so there isn't a back to share with this one. When I was a child bluebirds lived in the canyon. These days the they can't be found there anymore. I remember my siblings and I once found a bluebird nest lying on the old canyon road. When we picked it up, three little bluebirds flew up and away into the trees. I think I was about 11 years old. One tiny bluebird came to visit my current home a couple of years ago--he decided to take a bath in the little pond next to the waterfall. I was SO surprised to see the little fellow and felt I'd been blessed. I am still ill. If this doesn't get better, I'm heading to the doc. Happy Postcard Friendship Friday and have a wonderful weekend, dear Friends. 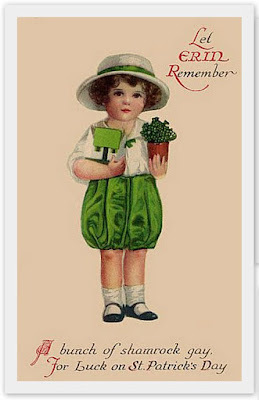 Isn't this little one sweet with her "bunch of shamrocks." 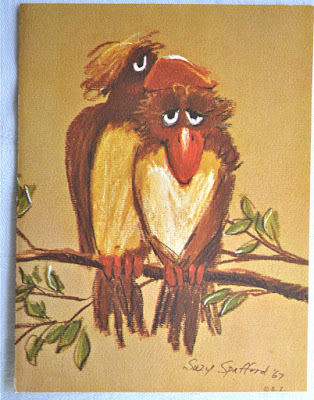 I know "gay" means something else these days, but back when this card was made it simply meant joy or happiness. I am still very ill. This is a bad flu. I didn't get this up in time, either. I apologize for that, sweet Friends. The title of my blog, "The Best Hearts are Crunchy," comes from a comment made years ago by a five-year old girl, as she thoughtfully perused a tempting box of Valentine's Day candies. She is probably a grown mother by now, with children of her own. I loved what she said so much, I wrote it down on a napkin. I am interested in vintage cards, postcards, history, people, art, drama, old books, music and photography. 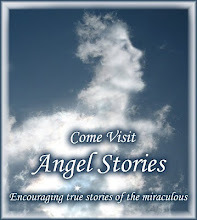 I enjoy discovering the root meanings of words, I love stories and I like writing. When I see something unexpected, unusual, or beautiful, my focus suddenly sharpens and intensifies. The sensation tickles! That's when I say something "fills my eyes." It is the greatest compliment I can give. Over the years, I have gathered together a large "cyber" collection which I often refer to for Postcard Friendship Friday and Guest Heart Thursday. 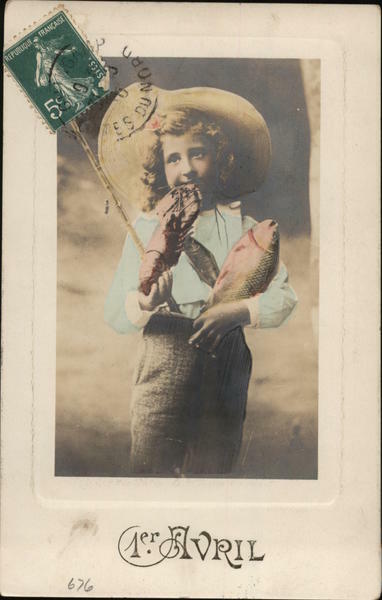 I don't always remember where they came from, so if any of these wonderful postcards, cards, or other ephemera came from your site, let me know and I will add a link to your blog. Copyright information can be found at the bottom of this page. 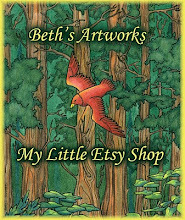 I have collected vintage cards, fairytale books, postcards, old photos and art pieces since I was a small girl. Even before I could read, I spent hours looking at old cards, coloring books and illustrations in my fairytale story books. I am sure my love for art and even my own drawing stylings came from my fascination with them. 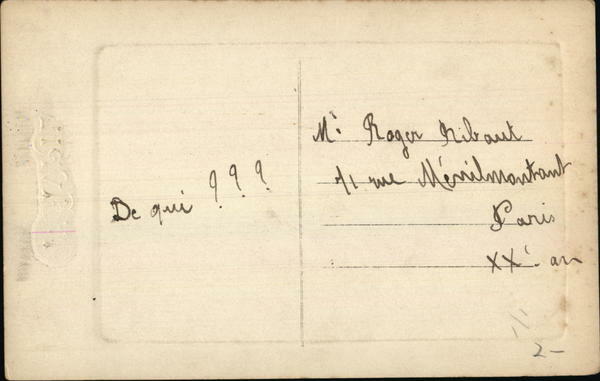 Mail was so rare, I saved every card and letter I received as a child. Some of those nostalgic items will be shared on this blog. Quite a few of the vintage pieces I have collected reflect the life and times of history itself. The cards, postcards, antique photos and art from my collection are dated from the late 1800's, through WW2. Many of these old cards come from our darling little Grandmother Jenny. I have also included some items from the early 1950's which were given to me by my precious Gramma Gladys and dearest Nita. In a very real way, this Blog is my way of honoring these marvelous inspiring artists and the ongoing influence they've had in my life. I hope you will enjoy the beauty, tremendous skill and sometimes whimsical work of these long-gone artists as much as I have over the years. 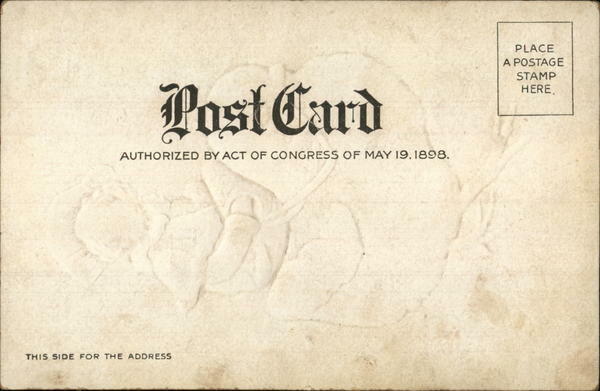 If you know any historical information concerning these cards, photos and postcards, I would LOVE to hear from you. Some of the images in my "Cyber" collection are from CardCow. A big Thank you to Eric Larson for his permission to use them! This is a link to my favorite book reviewer. Rena Lanyon gives a well-written review from a youthful perspective. 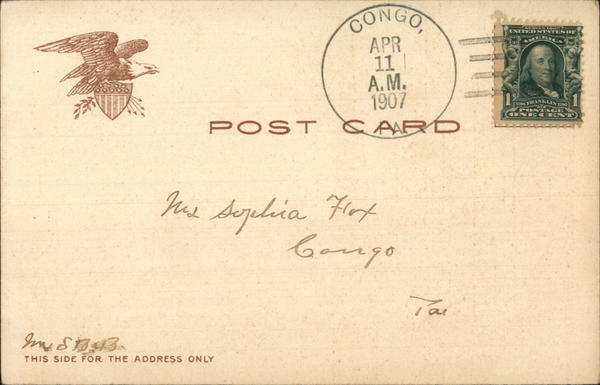 Artwork including cards, postcards, illustrations, etc., printed before 1930 are no longer copyrighted, but are under Public Domain. However even then, there are lots of gray areas concerning what is Public Domain and what is not. Scans of public domain images do not generate new copyrights—they merely inherit the copyright status of the image being reproduced. In other words, if something is public domain and is scanned--it remains in the public domain. ONLY if it has been uniquely altered in some fashion.